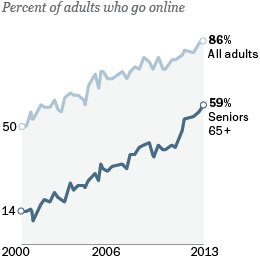 Overall, technology adoption among seniors has been increasing slowly but surely. Today, three quarters of seniors have a cell phone, six in ten use the internet, and almost half have broadband at home. Those still trail the national average, but they have been steadily increasing since we began tracking these metrics way back in 2000. 1) The first group of seniors is fairly plugged in—they own a fair number of technology assets, have integrated these tools into their lives, and view that connectivity as a positive thing. This group is relatively young, educated, affluent. 2) The other camp is largely disconnected from the digital world. They don’t use technology to any great degree, they would not feel comfortable learning how on their own, and in many cases they don’t feel like they are missing out on too much. This group is both older and less affluent, and they often have significant health or disability issues that make it challenging for them to use technology.